With all the latest trends in bathroom designs showcasing modern baths and fixtures it's surprising to see this kind of bathroom shown above. Seeing all these bathroom furniture and fixtures made of sturdy wood materials made me remember all those stories of my grandmother about the past generation's furniture. Actually this one is so elegant in wooden form and I wouldn't be surprised if this was taken from a beautiful old house or perhaps a hotel. 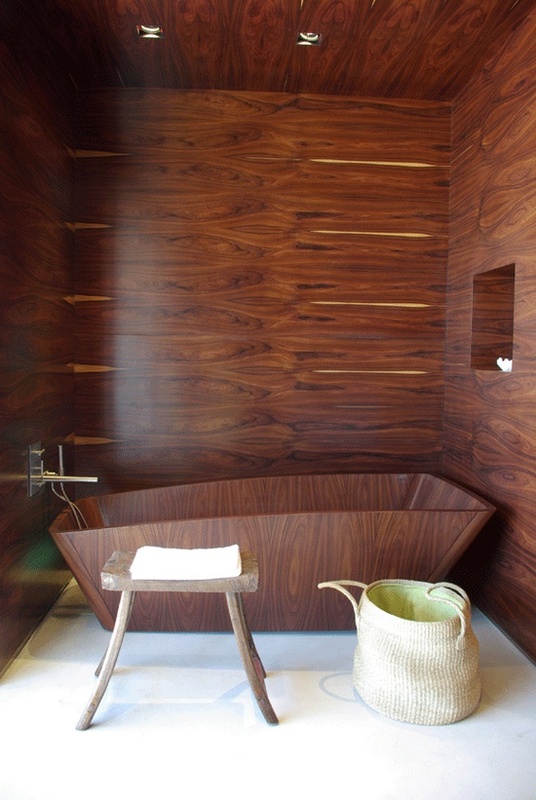 The wood used here is undoubtedly from a high quality wood with elegant hues and textures. Well I love this idea except that I'm not sure if it's laminated enough to endure water seeping the wood bath tub. Anyway with the modern technology in home designs it's now possible for wood to use in water environment without rotting. Nice home idea.